AGT Food and Ingredients is one of the largest suppliers of value-added pulses, staple foods and food ingredients in the world. We buy lentils, peas, beans and chickpeas from farmers around our 40+ facilities located in the best pulse growing regions in Canada, the United States, Turkey, Australia, China and South Africa and ship our products to over 120 countries around the globe. We create value for producers, quality products for our customers and growth for our shareholders. AGT Food and Ingredients (formerly Alliance Grain Traders) was founded in 2007 with the acquisition of Saskcan Pulse Trading by the Agtech Income Fund, the predecessor to Alliance Grain Traders. The fund was re-branded the Alliance Grain Traders Income Fund and a new leader in the global pulse industry was born. In 2009, Alliance Grain Traders completed a conversion to a dividend paying corporation and a transformational acquisition with its acquisition of the Arbel Group, creating a global leader in the processing, trade and export of pulses and staple foods. The acquisition also included the Arbella Pasta brand, one of the best-selling domestic brands of pasta in Turkey that is also being sold in over 90 countries worldwide, and the largest bulgur and durum wheat and semolina milling facilities in Turkey. In 2014, Alliance Grain Traders underwent a name change to AGT Food and Ingredients to reflect its expanding business and increased focus on pulses, staple foods, food ingredients and packaged foods. This philosophy is part of our guiding principle “From Producer to the World”. AGT Foods is an active exporter to all geographic regions, serving a network of customers in the Americas, Europe, Africa and Asia. The company currently employs over 2000 full-time staff and is actively exporting to over 120 countries. The core business of AGT Foods is supplying customers with premium quality Red Split and Football Lentils, King Red Lentils, B90 and Kabuli Chickpeas, Laird/Eston/Richlea Lentils, Queen Green Lentils, Yellow Split and Whole Peas, Green Split and Whole Peas, Whole and Split Desi Chickpeas, Navy Beans, Pinto Beans, Dark and Light Kidney Beans, Black Beans, White Beans, Faba Beans and other specialty crops such as Canary Seed. AGT Foods facilities feature systems for cleaning, calibration, peeling, splitting and colour sorting on a full line of pulses. With its facilities in Turkey through the Arbel Group, AGT Food and Ingredients also offers beans, rice, milled durum wheat and bulgur products. Through the Arbella brand, AGT Food and Ingredients offers a full line of packaged pasta products for the domestic Turkish market that is also exported to over 90 countries around the globe. In 2013, AGT Foods commissioned its first large-scale pulse ingredient and fractionation facility in Minot, North Dakota, focused on production of flours, proteins, starches and fibres derived from pulses for use in food ingredients and branded feed products including pet food and aquaculture. The commissioning was completed in 2014, with additional capacity added later that year. AGT Foods also announced the acquisition of bulk grain handling assets in 2015. The rail transportation and loading infrastructure will be essential elements to the competitiveness of AGT Foods’ legacy business segment, both for customers and to supply pulses and durum wheat to AGT Foods’ global operations. 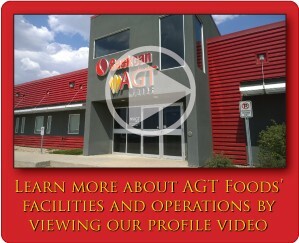 In 2019, AGT Foods delisted from tje Toronto Stock Exchange througha privatization process by a group of investors led by AGT's President and Chief Executive Officer, Murad Al-Katib, and including Fairfax Financial Holdings Limited and Point North Capital Inc.
Arbel has been a supplier of food products and other goods and services for more than half a century. Arbel Pulse Grain Industry & Trade S.A. maintains its production facilities in Mersin, Turkey with a daily capacity of 4,000 metric tons. The company is the largest exporter of pulses in Turkey, exporting to all geographic regions and serving a network of customers in the Americas, Europe, Africa and Asia. The Arbel Group facilities in Mersin are located on a 1,000,000 sq. ft. parcel of land equipped with 38,000 metric tons storage capacity steel silo facilities and more than 50,000 metric tons storage capacity in horizontal warehouses. Arbel maintains its leadership role in production and processing through a continuous Research and Development program. Arbel S.A. facilities include cleaning, calibration, peeling, splitting and colour sorting lines for the production, processing and export of red split lentils, whole red lentils, green lentils, chickpeas, white beans, bulgur, pasta, semolina, durum wheat and wheat flour. Trading activities include rice, edible oils and crystal sugar, vegetable oil, salt, potatoes, fresh fruit and vegetables. For over 20 years, Arbel has been a leading supplier of food and emergency relief items to international development agencies, NGO sector and aid relief operations, including the World Food Program, the United Nations Relief and Works Agency, and the Red Cross and Red Crescent. Arbel has introduced Tüv Cert EN ISO 9001:2000 Quality Control System to assist the company in promoting and expanding its marketing activities throughout the world. The company has diversified its activities into the tourism and hospitality industry through a resort development of 100 acres by the Mediterranean Sea including a motel/restaurant and camping resort. 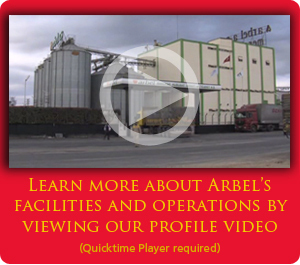 In 2009, all food production-related operations of the Arbel Group were acquired by AGT Food and Ingredients.